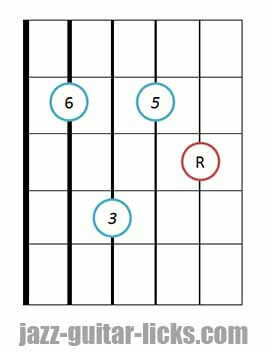 What are major 6th chords? 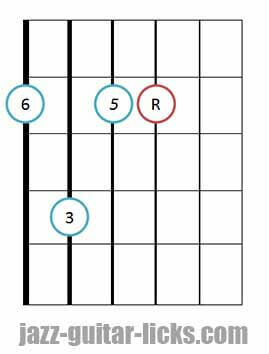 Major sixth chords are built with four notes. They consist of a root (1), a major third (3), a perfect fifth (5) and major sixth (6). This means to add the sixth note of the major scale to a major triad. For example, a major triad is made up of three stacked notes, ( C,E and G). 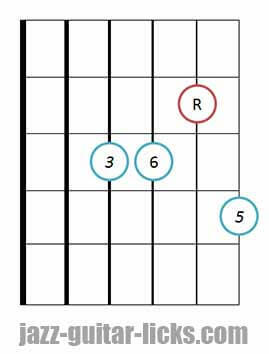 To get a C maj6 chord you just have to add the sixth of C which is A. 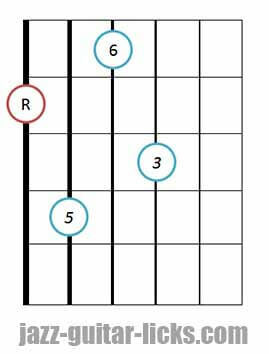 Major 6 chords contains the same notes as their relative minor seventh chords. The relative minor is exactly 3 semitones below. 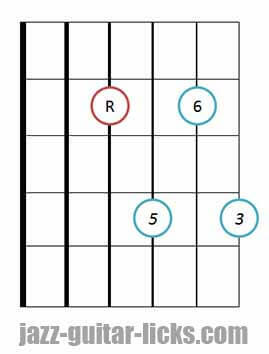 A minor seventh (Am7) is the relative minor of C major 6 (CMaj6). 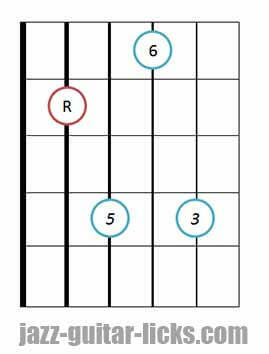 Major 6 chords can be written M6 or simply 6. There are no differences between a CM6 and a C6 chord. 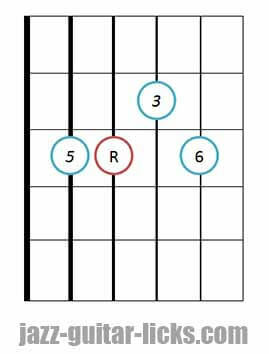 Furthermore, it is important not to confuse with dominant 13th chords. 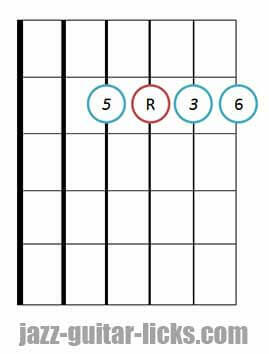 These are dominant 7th chords with a 13th added. When a 6 is added to a tetrad chord (four notes), this one is considered as a 13th. The seventh converts the sixth as an extension. 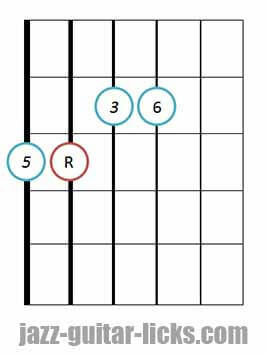 You can build maj6 chords by lowering the 7th of any major 7 chord position. 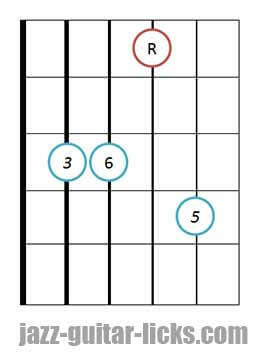 The following guitar diagrams and voicings are based on the drop 2 major 7th chord shapes with the 7th lowered by 2 semitones. In other words, the 7th is replaced by the 6th. 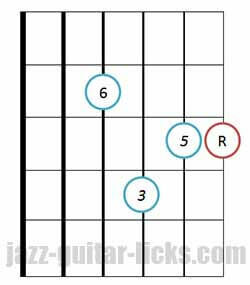 An arpeggio is a chord whose notes are played on by one. 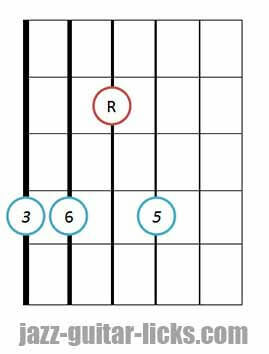 Here are two shapes that will help you make the relation between major 6 chords and arpeggios. It is important to remember the location of the root in each shape. Then, try to play the chord and its related arpeggio.